This tab of the Configure dialog specifies behavioral user preferences for YAAC. Whether YAAC should beep when a priority or emergency message is received (it will always flash pointer arrows at the reporting station). Whether YAAC should flash yellow pointer arrows at a station reporting MicE Special status. Whether the map should auto-pan to center a station sending an emergency message. The amount of time that dead-reckoning should be done for a moving station or object until we assume that it is no longer transmitting data. The maximum amount of time that a track stripe should be drawn for a moving station. Whether the map background should be suitable for daytime viewing (light gray) or suitable for viewing in dim night-time conditions (black background). Note this feature is still experimental and does not apply to all views yet. Whether or not vicinity plotting should be used for stations that have not reported their own position. Vicinity plotting uses the location of the station's first digipeater to hear the unlocated station over RF as a "hint" for locating the station with unknown position until that station announces its position. For more information, consult Robert Bruninga's whitepaper on the topic. Note this also enables approximate location of "stealth" digipeaters (those digipeaters that do not transmit their own position beacons, but use only digipeat path tracing to transmit their callsigns for legal identification) based on the reported positions of the originating stations using them. Stealth digipeaters are identified with the symbol until and unless they provide a beacon with a symbol of their own. Whether the transmitted beacon should automatically update its symbol to indicate whether or not the local station is manned by an operator, and how long the operator should be inactive before the station is considered unmanned. Note this only functions if the station symbol is from the alternate table (backslash "\" table ID) and is not already using an overlay (regardless of whether the overlay is for an APRS 1.2 extension symbol or not). Specify whether YAAC should try to automatically download missing pre-imported OpenStreetMap tiles from the author's website when the user views map areas needing the missing tiles. Whether the Raw Packets table view should use the embedded timestamp of historical APRS messages to sort the messages, or always use the actual time of message receipt. Whether APRS Objects and Items created or taken over by this station should be preserved and resumed the next time YAAC is started. Choose whether stations/objects specifically selected for motion-tracking should forcibly pan the map to ensure the current position of those stations remains visible. Choose whether the extended APRS 1.2 symbol set should be used for displaying stations and objects with overlay symbol table ID's. 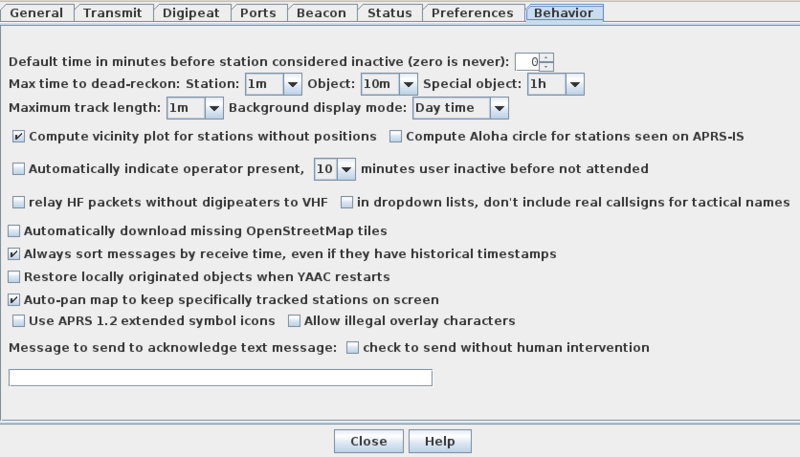 This also affects filtering by symbol for stations using the extended symbol set. Choose whether alternate table symbols can use illegal overlay characters. Currently, the Duchifat-1 satellite is the only part of the APRS network that not only allows illegal overlay characters, but requires them for a user identification; for all other usage, this option should be left disabled. For more information, see http://www.h-space-lab.org/php/duchifat1-en.php. Specify a short text message that can be sent with a single menu selection to acknowledge a received APRS text message, and specify whether the pre-recorded reply message should be sent automatically (without human intervention) or by a popup menu selection.